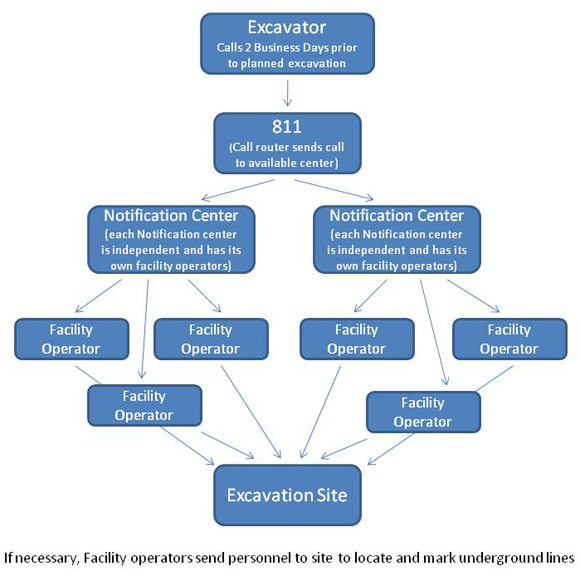 The purpose of the One-Call Board of Texas (OCB) is to establish and operate a “one-call” excavation safety and underground facility damage prevention notification system designed to provide excavators with the capability of making only “one-call” prior to excavation, whereby all utility companies (except water and sewer) with underground lines in the area receive notice of the planned excavation. The utility operator is then given the opportunity to physically locate and mark the approximate location of its underground lines to help the excavator avoid accidental damage. The excavator does not have to make multiple calls or attempt to determine what facilities may be present and identify unknown utility operators. All operators of underground facilities (except water, sewer, and slurry) are classified as Class A Facility Operators and are required to register with the OCB and enroll their facilities with the Notification Center of their choice. The Texas Notification System consists of two separate Notification Centers. Each Notification Center is responsible for receiving information about a planned excavation and sending that information to its member utility companies and the other Notification Centers. Once notified, the utility companies have two working days to send their personnel or contract locators to the excavation site to mark the approximate location of their underground facilities. With some exceptions excavators planning to dig 16 inches or deeper using mechanical equipment are required to call the statewide number “811” or contact directly one of the Notification Centers via phone, fax, or email. Excavators must call no sooner than 14 days nor less than two working days (48 hours excluding weekends and holidays) before beginning the excavating. The excavator should contact only one of the Notification Centers. That Center will relay the information to the other Center and both will notify their member utility companies. The Texas One-Call law is found in the Utilities Code, Chapter 251. Excavator calls one number (either 811 or directly to one of the Notification Centers) and gives details of the planned excavation. Notification Centers share “locate request” information with the other Notification Center. Each Notification Center determines what potential conflicts exist and notifies their appropriate member Facility Operators. The Facility Operator then has the opportunity (two working days) to send personnel to site to locate and mark its underground lines or notify Excavator of intent to not locate.